On reflection, maybe this should be in the Wheels, Tires, Suspension & Brakes Forum. What do people think? Mods? Probably makes more sense since the ABC is not unique to the M275 powered cars. 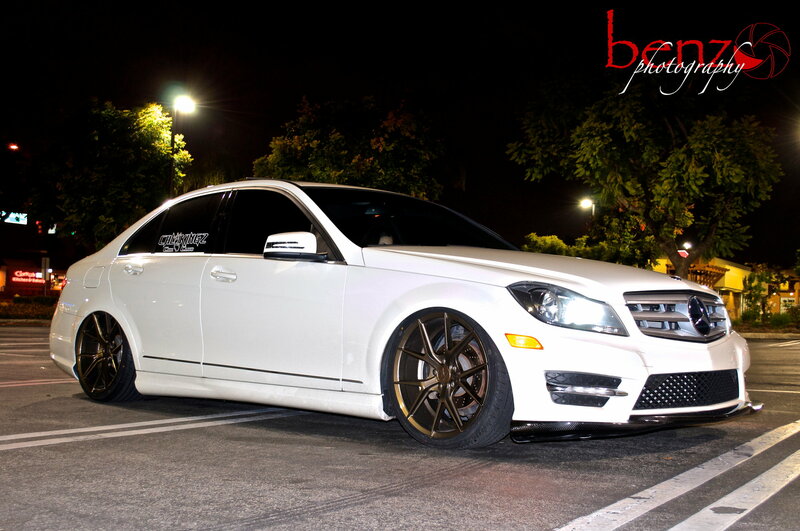 does anyone make coil overs for 2012 "w204" c300 4 magic? My 2004 S 55 JUST came with the ABC drive careful light I change the steerig pupm 4 years ago and for the last years was making a whining noise between 1000 and 1700 rpm:s I thing finally give up but how you can tell that ? where can I buy a new pump ,accumulators etc. ? The whining noise at that particular RPM is possibly due to a failed pulsation dampener. Those are a fairly simple fix. Similar to changing a light bulb. Unscrew the old and screw in the new. You can help to identify the whining noise (with a cold engine) by removing the auxillary drive belt (not the supercharger one) and starting the engine for a minute. If the noise goes away when you're inside the car with the doors closed, it means it's probably the accumulator. Unscrew the old and fit a new one. Its not QUITE as easy as that of course, but in the big scheme of things it's one of the easy wins. THIS is a thread about ABC suspension. Last edited by Welwynnick; 01-13-2016 at 01:25 PM. I'm convinced that many problems associated with the V12TT can be attributed to high under hood temps caused by the turbos. I never thought of adding turbo blankets though. I'm rather ignorant there unfortunately. I've seen lots of tuning shops sell them, and I appreciate the upsides, but I don't know about the downsides. I fabricated a couple of heat shields to cover the whole length of the coil packs, sitting just outboard of the existing heat shields. I stuck some temperature tape on the coil packs to see if that lowered their peak surface temps. The results aren't in yet. I also wrapped the charge cooler lines in foil and fibreglass heat mats, to help insulate them from the turbos and reduce heat soak. I did the same to the IC's themselves, though I doubt that makes much difference. I can monitor my IC coolant temperature from my pump controller, and it does stay cool. I turned down the target temperature from 30C to 25C yesterday, and sure enough it ran 5C cooler today. The other thing I've done is replace all the ABC hoses in the engine compartment with compression-jointed removable hoses, and add reflective thermal insulation to those as well. I think that long term, that will probably be the biggest win. Of course, adding insulation to the turbos themselves may tackle the root cause of the problem, as long as the turbos themselves don't get too hot. You have to consider both where the heat is coming from, and where it goes to. For example, I think the IC's problem is simply conduction from the surrounding hot air. Yes, they do cool themselves due to the circulating water, but we simply want to reduce the flow of incoming heat. Insulation or lagging should do that. I've got some pictures of what I've done, and I'll post them today. The coil packs on the other hand, are a rather different problem. They're in line of sight of the turbos, so they're subject to infra-red radiation, and they DON'T cool themselves. 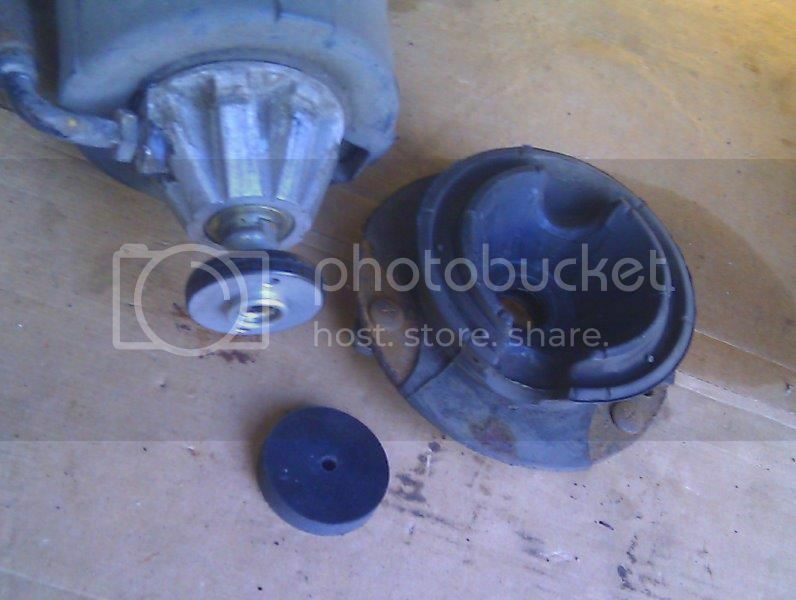 Mercedes solution is to screw insulating covers to the exposed center sections. The insulation does have a reflective outer layer, but there's insulation in between, and they're in contact with the coil pack. I don't think this is a good idea, as there's no air under the shield, and heat will conduct through to the coil. When manufacturers insulate exhaust systems, they normally use single skin metal shields that provide a barrier for IR radiation and convecting air. They provide no insulation at all, but they're very effective. The key thing is that air is able to flow past both sides of the shield, so temps are never allowed to build up. I think that's what's needed for the coil packs, so I built a pair of ally shields that stand off the coil, allowing air to flow down both sides. It took a few goes, and mounting them is tricky, as there's not much room, but it help if the stock shield is removed. I fitted one, and left the other off, to see what difference they make. I put temperature tape on the coil packs, and I'll take the intakes back off soon & look for any difference between them. What I did notice on Sunday is that on my first long journey for nine months, it never misfired and threw a CEL. Even with both new coil packs, that's still unusual on a long run. 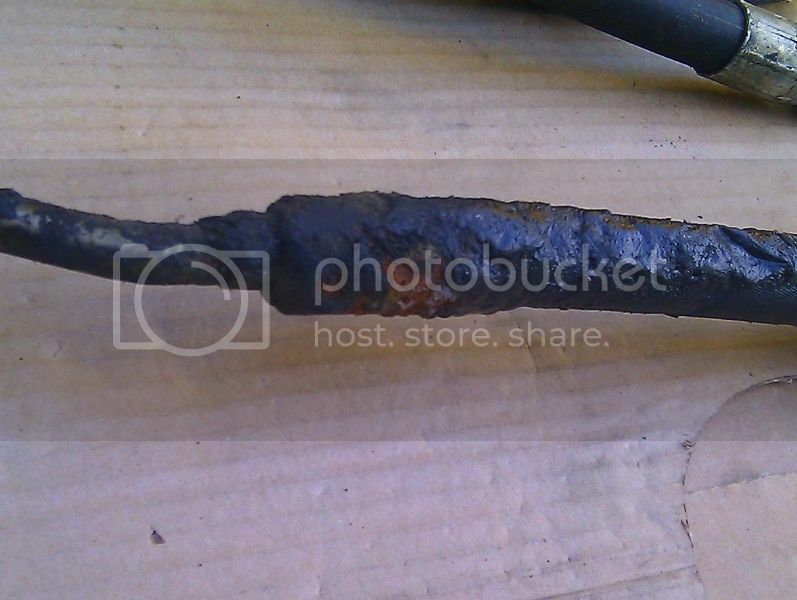 However, the feed pipe from the pump to the regulator wasn't protected, and looks horrible. Draw your own conclusions. Therefore I protected all the new ones with firesleeve. This is 30mm ID, which is too large. 25mm is ideal. If I was ever mad enough to buy another car with ABC, I would do all that straight away as a matter course, regardless of the condition of the pipes. Fitting those pipes can be difficult. 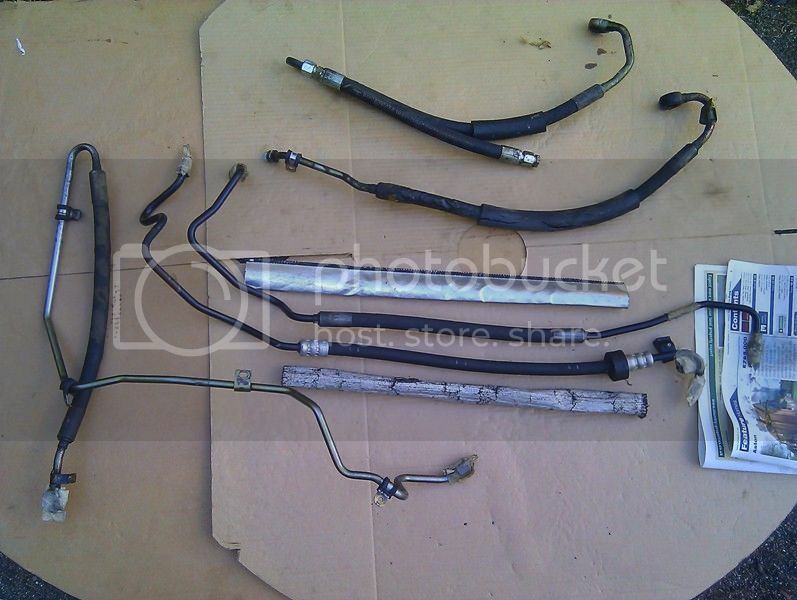 What I did was support the engine, undo the engine mounts and drop the front of the subframe. In this picture you can see how easy it is to access the pipes, the PAS output connection, the diverter valves, and even the ABC output banjo - that's SO difficult otherwise. These orange heat tubes work great. We use them on our race cars and they work great on msd plug wires to prevent RF noise. I'll add my 2 cents, I got the rear bolt out with a 1/4 drive swivel and a very long extension coming in from under steering rack. Also, if you need to raise left side of engine, it's simple. Remove the lower bolt and raise engine. If your worried about lining the mount back up, remove the factory bolt and install a longer bolt so mount falls back down in original spot. The following users liked this post: GLENN S.
That is the main pressure line from the pump. I replaced mine in my garage without pulling the motor. You do have to unbolt the motor mounts and disconnect the upper radiator hose, then jack up the engine. I used my engine hoist to lift the motor enough to remove the old hoses and instal the new ones. Your A/c has to be discharged as the suction line to the compressor has to come off as well. Dear Nick, Thank you for your fantastic ABC thread which I have read in detail but I am still a bit unsure which pipe has blown and so is the MB dealer! They said the car is "old and rare" which means they can't identify the exact part. They did a video and it runs down from the UK passenger side pump to a joint with a pipe that runs up over the gearbox to an accumulator on the drivers side. There are several ways to tackle this, and your dealer isn't much help. "old and rare" is a bit weak. Its the same technology as used on the current S and CL. Firstly, what's the actual problem? Is the car still drivable, does it have warning messages, or has the suspension collapsed, leaving it undriveable? Secondly, do you want the dealer to fix this, or do you want to? 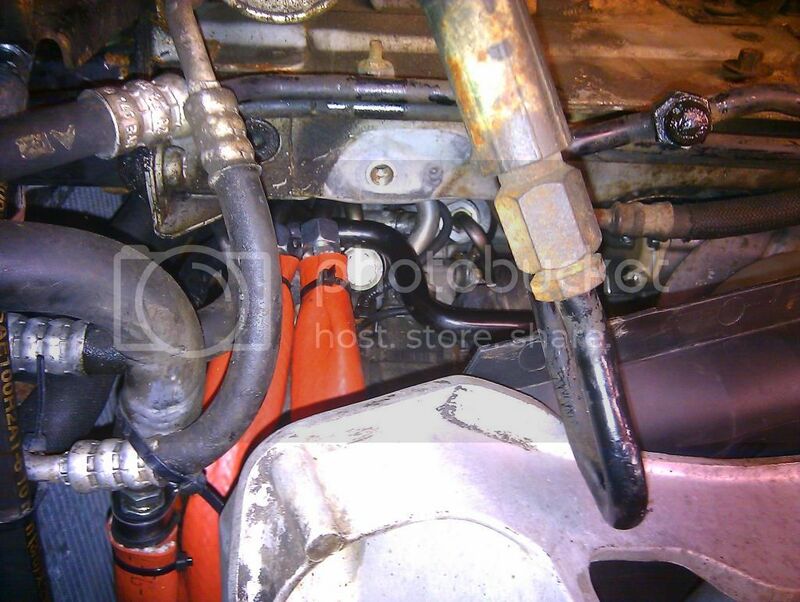 Thirdly, yes, you can definitely replace the pipe without removing the engine. Just lift the engine a few inches, or drop the front of the subframe a few inches. 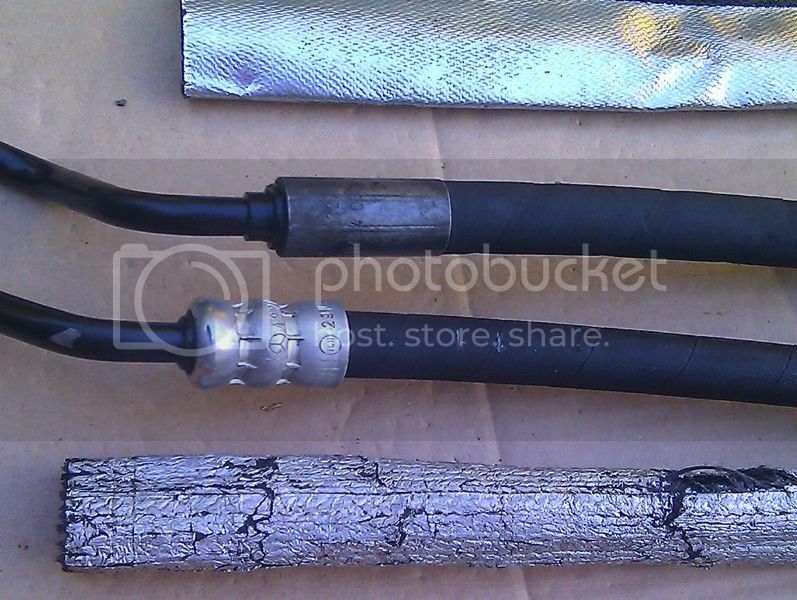 Finally, do you want to replace the hose with a new one, or do you want to repair it? Either is fine. Be aware that the pipe in question is two pipes, and there's a threaded union at the front right corner of the engine. Assuming you have a failed flexible hose joint, you will need to establish which one - the one that runs in front of the engine, or the one that runs behind it. Also be aware that if the ABC fluid reservoir is empty, you must not start the engine, or the ABC tandem pump will be wrecked in short order. Its fairly expensive, difficult to fit and difficult to bleed. Finally, can you confirm whether its hose 215 or 260 that's failed? 215 is part number 2203205272; 2203202672 or 2203203972, and runs from the pump to hose 260. 260 is part number 2203205572; 2203203272 or 2203204272, and runs from hose 215 to the pressure regulator/accumulator. Last edited by Welwynnick; 04-24-2016 at 04:53 PM. I know when I was replacing my HPE hose, the first time, my part #215 on Nick's diagram above was weeping, so I replaced both. Barely any more labor to do 260 if you are already doing 215, and then you don't have to pay for the labor (or in my case do it yourself) twice. If 215 is fine and it is just 260 leaking, that should be a lot less work/labor than doing #215. You will still have to jack up the motor, but will not need to discharge the A/C and remove the hose from it, etc. What Dr matt said. In fact, if you're going to replace 215, you may as well replace 220 as well. If it hasn't started weeping yet, it soon will! Wow I certainly am a newbie to all this. Having trouble seeing which hose it is but think its 215 as it appears to have burst where the flexi joins near the starter motor according to the technician video. I am really wanting an indy to tackle this as £1800 is more than I can really put into this car as even at 87K miles its only worth £3K. MB say they turned it off "pretty quick" so hope that means its already new tandem ABC pump is OK? The car went in drivable with a leak and burst as they were looking at it. It seems a shame these cars become virtually worthless at the dealer. Had issues with leaking RR shock and did a lot of reading on the forum and decided to cut my losses and did the conversion over to the coil over strut, after a few weeks the car dropped back to regular height and drives and handles really well and don't need to worry about any more issues with the suspension. don't plan on having to put chains on or drive down any dirt roads, so it should work out fine. hi which coilovers did you get? Hahahaha! Wish I had read this before trying to remove my ABC pump! So grateful for your guidance, Nick. I think most well-used W215's and W220's will suffer from this problem, and it can be easily fixed. The improvement to the ride and handling is really worthwhile on broken surfaces. 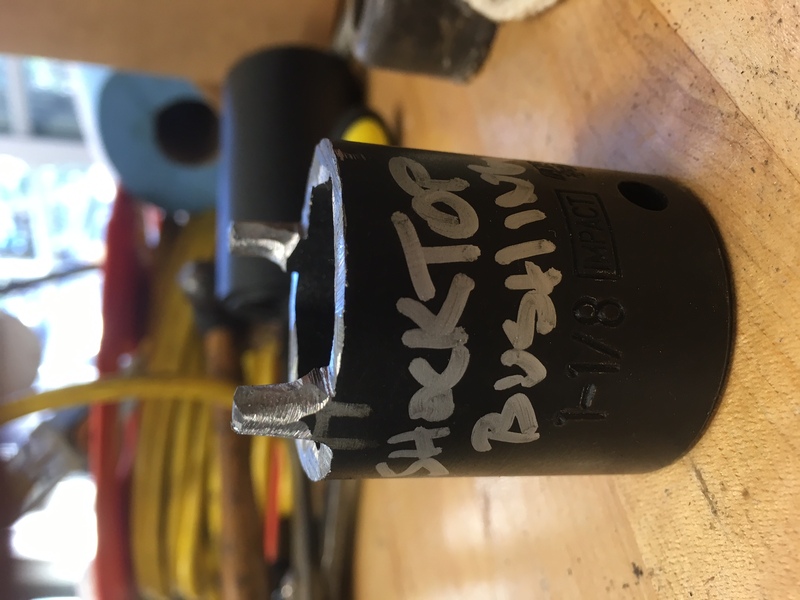 On the rear strut, the bush appears to be bonded to the metal mounting. I don't think this causes problems as readily as the front, but the bush can come free due to corrosion or bonding failure. The only solution I found was to replace the strut. Buy a good used one off ebay, and its not too expensive or difficult (as long as the so-called quick-release connector isn't seized). 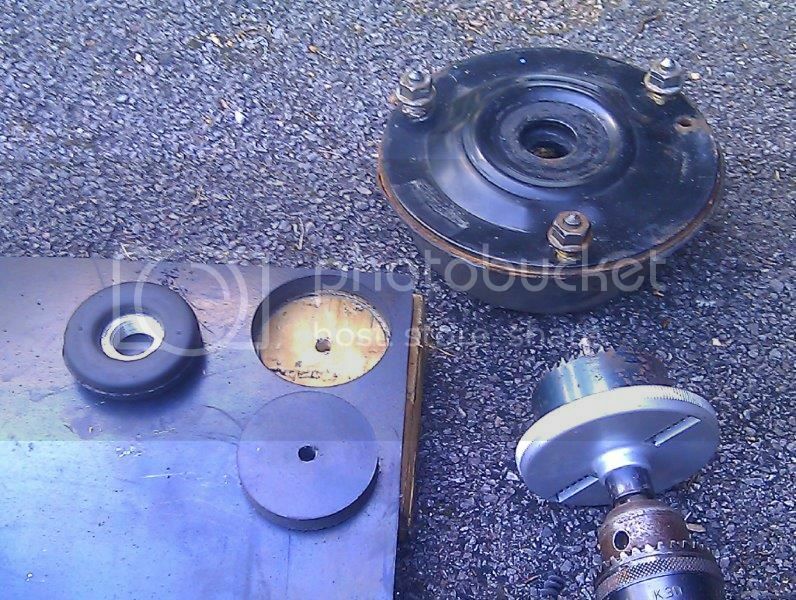 I cut some small doughnuts out of a 10mm rubber sheet and put them under the top bush nuts. You need a stout 35mm pin spanner. Don't even need to lift the car up - in fact its better if you don't. The ride is much better now. You can't do the same trick with rear struts unfortunately. Its an angle grinder type of spanner that you need; not a C spanner. The one that you linked on ebay looks suitable. You can't use adjustable ones; they're not up to the job. Ask me how etc. You use the spanner to undo the large flat nut on the top of the front strut, in the centre. You remove the electrical connector first. 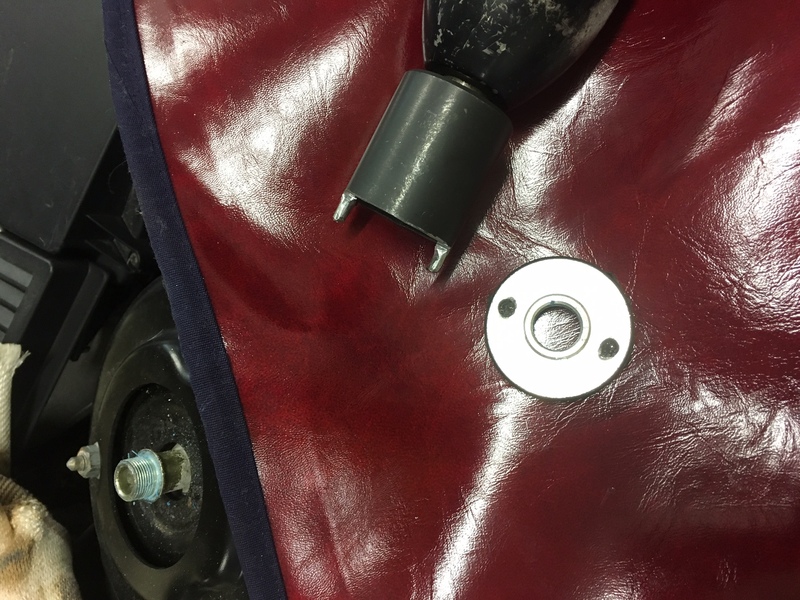 Don't jack the car up - you need the weight on the wheel to stop the rest of the strut from spinning round (which may damage the hydraulic pipe). Couple of additions I found while doing this repair today. 1. The large aluminum "nut" that you need to remove with the pin spanner has blue thread lock from the factory. I found that a few seconds on the four quadrants of the top of the disk (holding the torch very close to the surface) warmed it sufficiently to break the bond. 2. I was unable to remove the top disc with a pin spanner and ended up making a "special" tool out of a 1-1/8" cheap impact socket, using a metal band saw and grinder to fabricate. Worked great! I used an air impact on low setting with low air pressure to gently work the nut loose without turning the complete shock assembly. 3. A little Dow Corning 111 Silicon grease between the rubber parts really eases the reassembly. Yes, the top nut is difficult to undo, and you risk spinning the whole strut if you're not careful. I guess an impact wrench would help avoid that. I had to drill the pin holes right through the nut to get the spanner to stay put - it pops out all too easily. Same here as far as drilling the nut out - that really helped with the stability of the wrench. Using a fixed spanner wrench, the shock was still wanting to turn. I used the impact and socket tool to help with the turning aspect. The heat was an idea after the impact on low was not turning the nut. I knew it was aluminum and did not want to destroy it in the removal process. Saw the locktite after it was disassembled, now I understand the difficulty in getting it off without a small amount of heat. Thanks for your write-up. I did not know the top came off so cleanly. Great fix. Drove car last night and noticeable improvement in quietness of front suspension over washboard pavement. Still have one rear shock that has the same issue. Sorry, can't fix rear shocks the same way. Edit - correction - yes you can! Last edited by Welwynnick; 01-20-2018 at 12:48 PM. Anybody know where the rear lateral acceleration sensor is mounted on the 07 S65? Googling finds me every model but the W221. According to repair surge, it should be mounted at the top of the right rear shock tower. I looked and didn't see it. Rear shock is doing that weird thing that causes it to suddenly extend while driving. It doesn't cause any warning lights on the dash either.